Have you ever imagined succeeding at something you’ve been wanting to achieve or do in your mind and then it came to life? This mental power of picturing yourself succeeding in your mind before doing it is the amazing power of visualization. This meditative practice of positive thinking has been known to work and is in fact, practiced by many successful people including the big O (otherwise known as Oprah Winfrey) herself! For many years growing up, I believed I wasn’t ‘good enough’, ‘smart enough’, and ultimately worthy of success. This type of negative, self-limiting thinking didn’t result in anything except feeling more insecure about my potential and abilities. However, once I began to visualize myself in a positive light, succeeding in life, and doing the things I wanted to do…this is when the magic began to happen. This is when I began to become the person I envisioned myself to be! For example, I have always pictured myself standing in front of an audience inspiring and motivating them to live their best life. I would actually picture every small detail, including my outfit, who I would notice in the audience, the size of the crowd and the words I would say. This mental visualization came to reality a few years ago when I spoke at a couple of events. It was the greatest feeling knowing my thoughts became reality! The thing is, you have to believe you are worthy of the things you desire. You can’t just think it would be nice to have the thing or feel the certain way. You have to believe in yourself, first and foremost. In addition, another important aspect of this process is you have to believe in a future for yourself that doesn’t exist yet. But… before any of this power of visualization stuff can ultimately work, you have to be grateful for where you are now, in this very moment. You have to be present. You can’t wait for the thing you desire to feel whole. You have to feel this first. In other words, you’re not waiting for the vision to feel successful and complete you are already emotionally embracing this future reality in the present moment. I know this all may sound a bit woo-woo, but it works. In fact, it’s science. It’s the law of attraction. It’s quantum physics! Another way the power of visualization works is through vision boarding. I came across vision boarding for the first time through a friend who was working in an independent consulting business over a decade ago. She cut and pasted things from magazines and pasted them onto a poster board. Some of the things she had on her board were her favorite motivational quotes, things she wanted to become, along with some photos of the places she wanted to travel to. I’m such a visual person, and loved this idea! I truly believe when we put our positive mental images onto a vision board, this technique can truly help us manifest our desires and dreams. 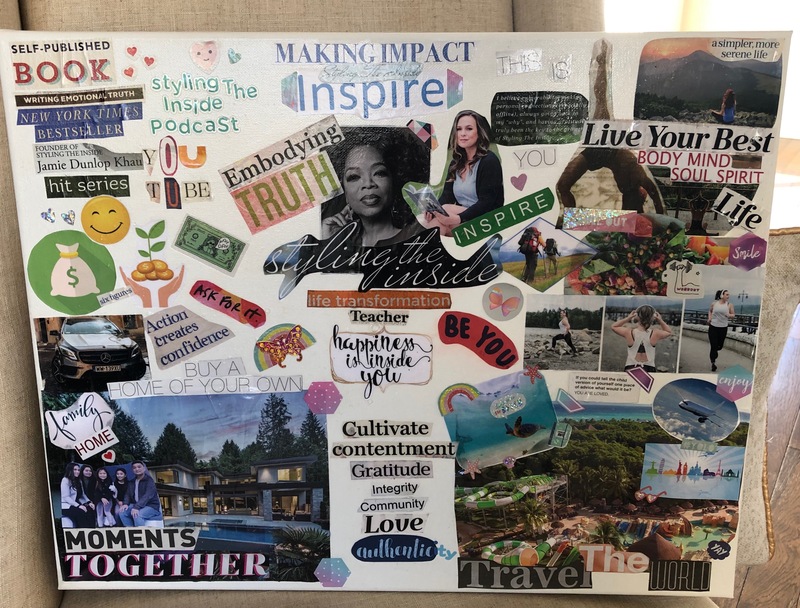 I haven’t made a vision board in a few years, so when Cindy Shaw, transformational life and brain health coach and founder of Best With Me Cindy reached out for me to review her vision boarding course I was super excited. I was actually thinking about making a vision board for 2019 so when she reached out, it really felt aligned and meant to be. 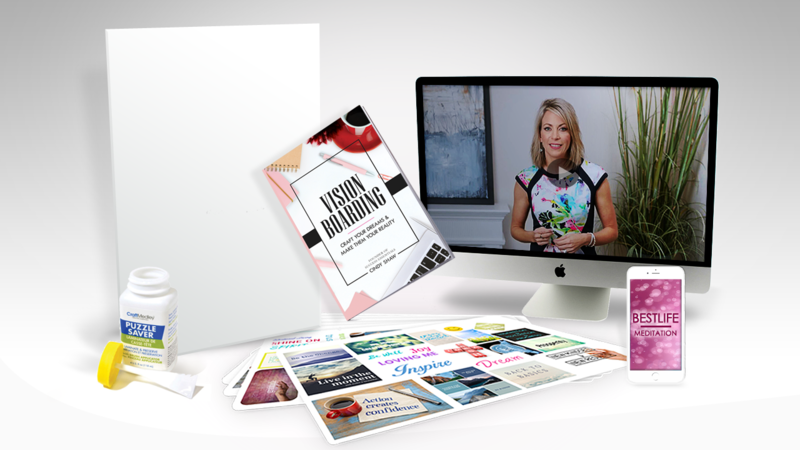 Cindy’s Vision Board Kit includes EVERYTHING you need to start attracting greater abundance, happiness, and success in your life, including an online workshop, all the tools you need to create your board, meditations, exercises, a handbook and tips for hosting your own vision board party. 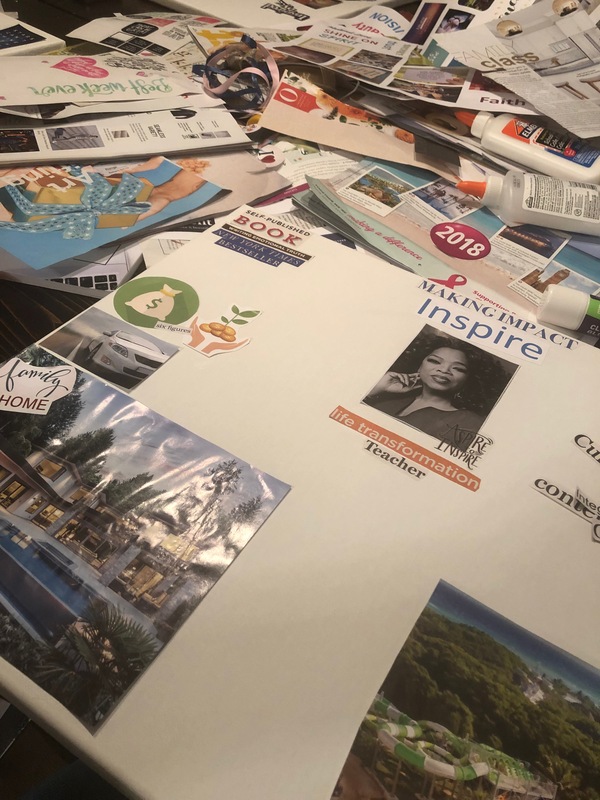 After watching her videos, and doing the meditation exercises, I brought the supplies to a friends house and we got to work creating our vision boards. It was such a relaxing and therapeutic way to end the year. Thank you to Best With ME Cindy for providing me with the tools to create my vision for 2019 and beyond. I have this in my bedroom and look at it every morning when I wake up and before I go to bed. I hope this blog post on the power of visualization and vision boards helps you move forward with manifesting the life you truly desire. I totally believe in the power of visualization and manifesting your desires. Last time I made a vision board I was a teenager/ young adult. Your post inspired me enough to make a vision board for myself this year. You are amazing! To a successful 2019. Happy New Year! Happy New Year! I’m so happy to hear that this post inspired you to make a vision board for 2019!